Next month, April 2019, the Centers for Medicare and Medicaid Services (CMS) will make changes to Nursing Home Compare and the Five-Star Quality Rating System. These sites were designed to help consumers, families and resident representatives compare nursing homes and the quality of care provided. CMS is striving to improve health care outcomes for residents and quality improvement across the country. The changes include health inspection process revisions, new staffing information enhancements and threshold changes, Five Star Rating threshold changes and new quality measure implementation. The Memorandum QSO-19-08-NH provides more details about these impending changes. The health inspection freeze that went into effect February 2018 due to a new health inspection survey process, will be removed. Facilities with inspections on or after November 28, 2017 will be included in the facilities overall star rating calculation. Like before, the health inspection rating will be based on three cycles of inspections. These cycles of inspections include the three most recent standard inspections and any complaint inspections occurring within the past three years. The cycles will return to the previous weightings, with the most recent year assigned a weighting factor of 1/2, the previous year with a weighting factor of 1/3 and the third year with a weighting factor of 1/6 of the health inspection score. CMS has also created separate short-stay and long-stay Quality Measure (QM) ratings. Each facility will continue to have an overall QM rating which will be used to calculate the overall nursing home star rating. The overall QM rating will be equally based on the short-stay and long-stay quality ratings. Some new measures have been added, including claims-based. 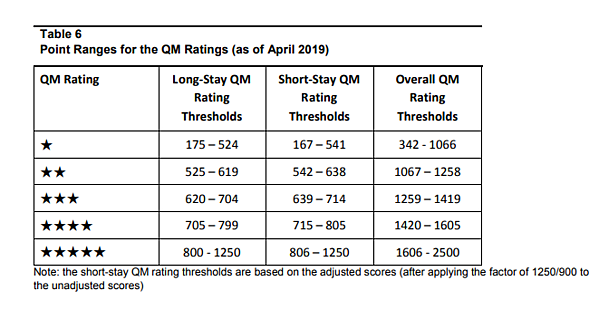 There will be 17 quality measures— seven short-stay measures and ten long-stay measures—affecting the Five Star QM rating. Staffing threshold changes were made to emphasize the importance of registered nurse (RN) staffing for quality. Currently, if facilities report no RN staff for seven or more days in a quarter, they automatically receive a one-star for staffing. Starting April 2019, CMS is changing the seven days with no RN to four days. Achieve your desired Five Star Rating with the help of LW Consulting, Inc. Contact TRaser@LW-Consult.com or call 610-314-5095.